In a city where Roman Catholicism pervades all aspects of life, SSC Napoli represents an article of faith. At times its devotees have blurred the boundaries between football and religion beyond recognition. But the sacralisation of southern Italy’s biggest club has also been fused with the profane. Never was this paradox more apparent than during the years of Diego Maradona. 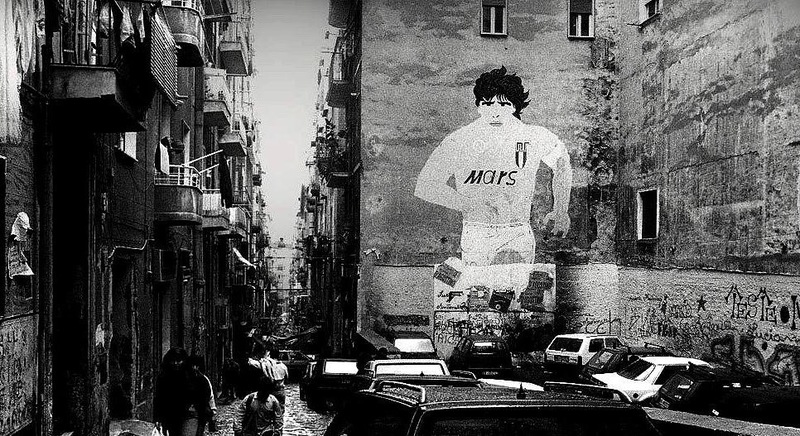 Maradona’s tenure in Naples, from 1984 to 1991, brought the Partenopei an unprecedented level of success. Two Scudetti, a UEFA Cup, a Coppa Italia and an Italian Super Cup were all won in the space of four glorious years between 1987 and 1990. Naturally, the Argentine was heralded as a messiah. Yet this deification did not just celebrate his élan and artistry on the field, it was also an acceptance of his vices off it, including drug addiction, purported tax evasion and his partying with organised crime bosses. Napoli’s followers embraced it all, his sacred footballing abilities and his concomitant profanities. But this halcyon era would come at a cost. For the departure of Maradona was the harbinger for an ill-fated journey, one that can be captured through the three canticas of Dante Alighieri’s Divine Comedy. Only unlike Dante, Napoli and their fans did not travel through inferno and purgatorio to reach paradiso. Instead, their journey began in the paradise of Serie A, from which they were dragged unceremoniously through the purgatory of Serie B, down to the hell of Serie C.
This is Napoli’s tale during the Football Italia years. One not of transcendent triumph, but disastrous decline. Naples was indeed lying dormant. But unlike its volcanic neighbour Vesuvius, its citizens – crammed into the bars, trattorie and if lucky, the Stadio San Paolo – were ready to erupt. The world may not have changed, but Napoli had won their first Serie A title after 61 years of existence. The previously desolate streets were transformed within minutes. Cars, buildings and terraces were draped in sky blue as exultant Neapolitans embarked on a summer of carousing and overindulgence. As John Foot observed, these celebrations reflected the Neapolitan character: irony, parody and a sense of macabre, obscenity and blasphemy. On the walls of the city’s graveyard, graffiti appeared in vernacular: ‘Guagliu! E che ve sit pers!’ (Guys! You don’t know what you are missing). Mock funerals were arranged for Juventus, with coffins and death notices confirming the passing of Italy’s Vecchia Signora. But beneath the euphoria, satire and schadenfreude, these celebrations were being driven by an overwhelming sense of pride. Pride in being Neapolitan. Pride in originating from the south of Italy. Napoli’s first title was not just historic in footballing terms, it also had broader socio-political connotations. At a time when the hostile, anti-southern politics of the regionalist and separatist Lega Nord party were finding expression in Italy’s terraces, Napoli’s success was a symbolic act of defiance. For years, calcio had reflected the economic disparity between north and south. Barring Cagliari’s Scudetto of 1970, this was the first time the Italian championship had been won by a club located to the south of Rome. Napoli had temporarily broken the northern monopoly, striking a shuddering blow for football in the Mezzogiorno. The message from Naples was clear: “May 1987, the other Italy has been defeated, a new empire is born.” Of course, Napoli’s number 10 embodied this dynamic. Maradona’s humble background and recalcitrant character immediately resonated with Neapolitans. His dishevelled appearance was merely a deceptive guise for his sublime genius – a dichotomy that inspired Italian journalist Gianni Brera to paten the nickname “the divine abortion”. In the 1987 Scudetto season, he top scored with 10 goals and was the standout performer in a league that boasted the likes of Michel Platini at Juventus, Marco van Basten at AC Milan, Lothar Matthäus at Inter and Zico at Udinese. For four triumphant years, his form amid Napoli’s resurgence continued. In 1989, the Partenopei took this resurgence to the continent, winning the UEFA Cup and disposing of Juventus, Bayern Munich and Stuttgart along the way. A year later they reclaimed the Serie A title, this time defying another northern powerhouse, Arrigo Sacchi’s AC Milan. Maradona was again the protagonist, scoring 16 goals. Naples danced to his every beat. But this was perhaps part of the problem. Amidst the Maradona hysteria, it was and remains easy to forget that Napoli’s success also owed much to the efforts of a formidable team. The 1986/87 side was built upon the resolute defensive cast of Giuseppe Bruscolotti, Moreno Ferrario, Alessandro Renica and Ciro Ferrara, who were protected by the deep-lying midfield duo of Fernando De Napoli and Salvatore Bagni. Going forward, the industry and contributions of Bruno Giordano (five goals) and Andrea Carnevale (eight goals) allowed Maradona the licence to express himself. Later, more attacking panache was added in the shape of the blossoming Gianfranco Zola and the Brazilian, Careca. The latter joined Maradona and Giordano in an attacking trident that was even awarded its own acronym – ‘Ma-Gi-Ca’. These characters were bound together by the firm leadership of head coaches Ottavio Bianchi for the first championship, and Alberto Bigon for the second. But above all, this team was regarded as Maradona’s. And when his personal life began to unravel, this set in motion their decline. It’s never a healthy balance to pile one’s hopes and dreams on an individual, no matter how bright the star. Brera may have nicknamed Maradona “the divine abortion”, but to Napoletani he was simply divine: a man worthy of god-like status. Throughout his time at the club, murals were made comparing him to the city’s patron saint, San Gennaro. One even depicted him in the arms of the saint himself. In reality, though, Maradona was very much human and prone to temptations of the flesh. His addictions, most notably to cocaine, were aided and abetted by the questionable company he willingly kept. His links to members of the Camorra – Naples’ organised crime syndicate – landed him in hot water, both literally and figuratively, when local newspapers published photographs of him partying in a jacuzzi with some of their bosses. Napoli tried to keep such activities under wraps. It is even said that Corrado Ferlaino – the club’s president since 1969 — hired private detectives to keep tabs on the unruly Argentine. But his cult status in the city had only buttressed his belief that he was above discipline and management. His chutzpah was not misplaced. In reality, as long as Maradona turned up for matches, he enjoyed something of a free rein. This pathological relationship was not conducive to the team’s long-term group efficacy. 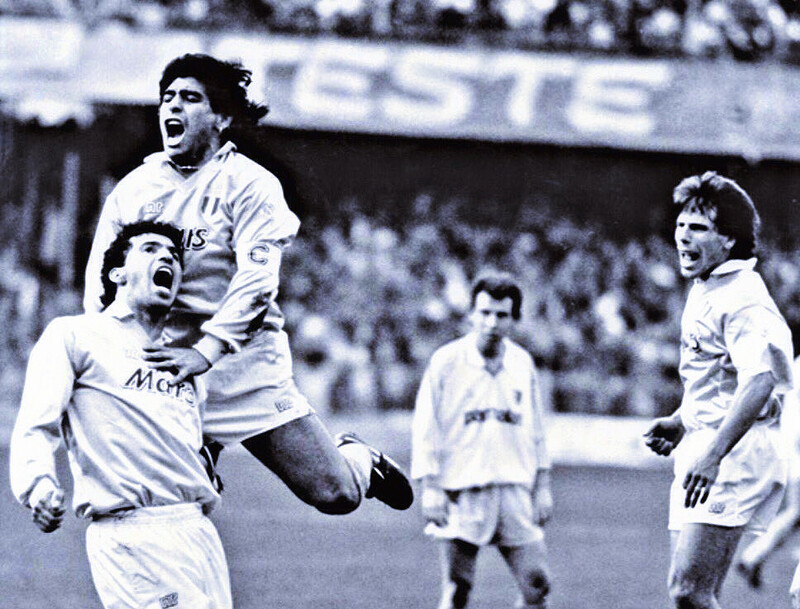 In 1991, when Maradona tested positive for cocaine after a match against Bari, he was handed a 15-month ban. The saviour of Napoli would not appear in sky blue again and it would take the club over two decades to fully recover. The Argentine’s absence during the majority of the 1991/92 season was masked by the emerging brilliance of Zola, who, under the nurturing tutelage of Claudio Ranieri, scored 12 times and helped Napoli to a fourth-place finish. However, after Maradona left for good in 1992, Napoli began to plot a steady path towards purgatorio. Having embodied so much of the club’s success, it is perhaps unsurprising that the self-destruction of Maradona was the portent for the club’s own disintegration. Napoli and their fans had arguably become over-reliant on the former Boca Juniors man, expending vast amounts of time, money and energy in keeping Maradona fit, out of trouble, and performing for the club. After all, their number 10 had cost them what had been a world record fee of £6.9m in 1984 – a sum met only because local politician Vincenzo Scotti used his connection with Italy’s banks to secure Napoli a loan. Indeed, while the club’s transfer dealings throughout the mid-to-late 1980s paid resounding dividends on the pitch, off it, their spending was neither sustainable nor shrewd. 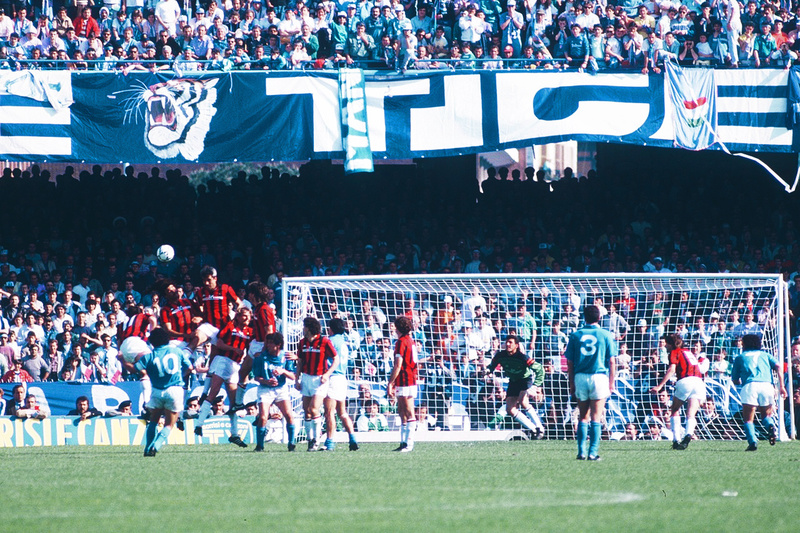 During the years following Maradona’s departure, Napoli remained competitive in Serie A, finishing sixth and seventh in the 1993/94 and 1994/95 seasons respectively. This was largely thanks to a talented crop of players, which had been bolstered by Uruguayan midfielder Daniel Fonseca and Italian youngsters Fabio Cannavaro and Benito Carbone. The Partenopei could also call upon the skill of adept tacticians such as Ranieri, Marcello Lippi and Vujadin Boškov. Unfortunately, this could not mask the financial cracks. Overwhelmed by a judiciary enquiry into his involvement in the Tangentopoli scandal, president Ferlaino’s financial travails left the club with substantial debts. 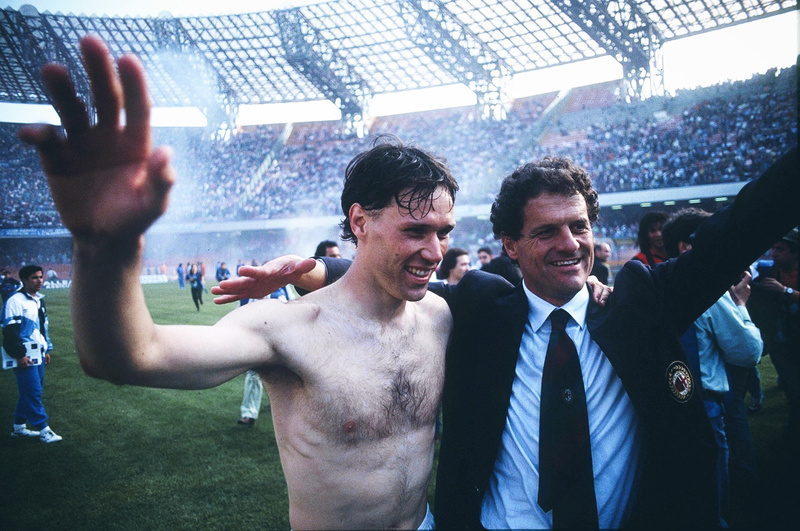 After being forced to step down in 1993, he returned one year later in an attempt to save Napoli from insolvency. With Ferlaino desperately searching for a panacea, a fire-sale of the club’s prized assets began. Both Zola and Cannavaro joined Parma’s revolution bankrolled by food conglomerate Calisto Tanzi, while Ferrara followed head coach Lippi to Juventus in 1994, and Carbone joined Inter a year later. The moves only served to confirm what Napoletani dared not admit; calcio’s balance of power had shifted decisively back to the north. Their form in the first half of the 1996/97 season offered a reprieve after the newly-appointed Gigi Simoni guided them into second place after 14 games. However, enthusiasm was soon dampened by a dramatic downturn in form and the departure of Simoni, who was jettisoned after Ferlaino discovered the coach had a pre-arranged agreement to join Inter at the end of the season. Youth coach Vincenzo Montefuso stepped in as the freefall continued, including defeat in the Coppa Italia final against Vicenza. Napoli won just two of their last 16 games, finishing four points above the relegation zone. But worse was yet to come. Much to the Napoletani’s chagrin, Ferlaino shed their finest talents once again: Fabio Pecchia went to champions Juventus, André Cruz to Milan and Alain Boghossian to Sampdoria. This left Napoli’s squad ill-equipped, and despite the stoic efforts of future Argentina captain Roberto Ayala, defensively they were shambolic, shipping on average over two goals a game. Ferlaino went through four different coaches (Bartolo Mutti, Carlo Mazzone, Giovanni Galeone and Montefusco), all of whom were hapless to prevent Napoli finishing an ignominious campaign with just two wins and 14 points. After 33 consecutive years in Serie A, and just eight after their second Scudetto, Napoli slid into Serie B. The last time they had been condemned to such fate, bankruptcy followed. History was about to repeat itself. Within two years, under the auspices of coach Walter Novellino, Napoli had returned to Serie A. But of all the hands dealt to Napoli fans, this false hope was perhaps the cruellest. Shortly before, media magnate Giorgio Corbelli had purchased a 50 percent stake in the club and become president alongside Ferlaino. Corbelli immediately made disingenuous promises, selling dreams of a return to European football. Despite Novellino’s efforts, he was offloaded in favour of the bohemian and serial entertainer, Zdeněk Zeman. Recruited at the behest of Corbelli, the Czech’s arrival was complemented by the signings of Striker Nicola Amoruso, wing-back Marek Jankulovski and the return of Fabio Pecchia. Zeman obdurately stuck to his attacking principles, determined to meet Corbelli’s expectations playing swashbuckling football. But his tenure was a disaster and above all short-lived. Just six games into the season, the former Foggia coach was fired. Napoli were winless and had conceded 14 goals – five in a home drubbing against Bologna. They turned to Emiliano Mondonico, a coach whose ‘pane e salame’ philosophy – simple and no-frills football – contrasted profoundly to that of Zeman’s. Mondonico was renowned for performing minor miracles with struggling or provincial clubs, having famously led Torino to a UEFA Cup final in 1992. He faired considerably better, registering notable wins against Lazio, Inter and a double over Fiorentina. Nevertheless, Napoli were relegated on the last day of the season after an extraordinary finale saw six teams separated by just two points from 12th to 17th position. Matters were compounded by yet more financial miscalculations. In a desperate gamble for survival, the Partenopei had recruited the mercurial Brazilian duo of Edmundo and Amauri in January. The gambit backfired and this time there would be no redemption. Neapolitans are known to be Scaramantici – superstitious types – however they may have been forgiven for believing the gods had turned against them since the departure of their own messiah. In September 2001, flooding opened up holes in the concrete of the archaic and rickety Stadio San Paolo, forcing the team to play their home games in smaller stadiums across the south. Meanwhile, more changes to the club hierarchy brought yet more instability. After a prolonged legal battle, Corbelli and his new partner (hospitality entrepreneur Salvatore Naldi) liquidated Ferlaino’s shares in the club and took complete control. Corbelli was later arrested in 2002 for a scandal involving the sale of television rights and the club descended further into the mire. Though the Partenopei continued to keep their heads above water in Serie B, their misery was complete when, in August 2004, the Civil Tribunal of Naples declared them bankrupt with debts totalling €79m. Their very existence was threatened until film producer and current president, Aurelio De Laurentiis, bought the club for €34m and enlisted them in Serie C under the new title, Napoli Soccer. These were previously uncharted depths. The inferno of Serie C had been reached. It speaks volumes for both Napoli’s prestige and the loyalty of their fans that, even during this nadir, the San Paolo could still attract crowds of 50,000-plus (a Serie C record). But the poignant demise of Italy’s fourth-best supported club took its toll. The financial debacle coupled with poor performances left Napoletani exasperated. The hierarchy was threatened and players attacked on numerous occasions, most deplorably when midfielder Renato Olive was surrounded by a group of young fans who threatened him with a knife. This great club had reached its lowest ebb. Napoli’s nickname, the Partenopei, is said to derive from Partenope — the name of the siren from Greek mythology who tried to lure Odysseus onto the rocks during his travels back to Ithaca. When she failed, Partenope killed herself and was said to have washed ashore near Naples. Though Odysseus may have resisted Partenope’s siren call by lashing himself to the mast of his ship, many clubs during the Football Italia years found themselves run aground having given into in the temptations of achieving short-term glory. Napoli’s decline was symptomatic of the financial mismanagement that bedevilled many of calcio’s giants. This made for a thrilling and intoxicating product, allowing Serie A to attract the world’s finest talent. As such, this era was not only a celebration of footballing genius, but also of unabashed extravagance. Unscrupulous owners were consistently profligate in the pursuit of instant gratification. Money was spent, borrowed or cultivated deceitfully. This proved the downfall of Parma under Calisto Tanzi, Lazio under Sergio Cragnotti, Torino under Gian Mauro Borsano, Fiorentina under Vittorio Cecchi Gori and, of course, the once defiant bastion of the south, Napoli. Imagine the scandal were Liverpool to go bankrupt and drop to England’s third tier. True, Napoli’s success both domestically and in Europe pales in comparison to that of Liverpool’s. However, their distinct cultural and regional identity makes the Partenopei, in social terms at least, comparable to the Reds. It is a fate that cannot be fathomed but one that befell this Italian giant. For all involved with SCC Napoli, this quintessentially captures their story during the Football Italia years.